Easter - What does it signify? Easter is the celebration of Christ's resurrection from the dead. It marks the end of Lent, a 40-day period of fasting and moderation. It is celebrated by gifting Easter flowers, eggs and other gifts. Our online delivery for Easter will ensure you can reach out to all your friends and relatives. The tradition of the Easter bunny leaving an Easter gift basket filled with treats such as Easter eggs and chocolates on Easter Day is common. There's also a tradition of sending flowers for Easter. Send Easter gifts online. Buy Easter flowers and order Easter gifts online on Flora2000.com. Easter 2019 - make it memorable! Easter gives you an excuse to indulge. And if you are sending gifts for Easter, why not be gracious? 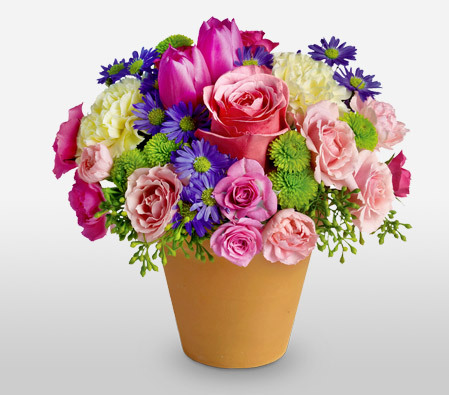 Gift your dear ones stunning flowers for Easter and other Easter gifts. Fill your Easter gift basket with smiles. Our fine Easter flowers and Easter gifts will take you down the memory lane and trigger the child-like excitement that Easter is all about. Make your pick from the very best and be sure to delight your dear ones with prompt Easter delivery.